The neighbours around Sol’s Coffee in Kuramae must be all right. 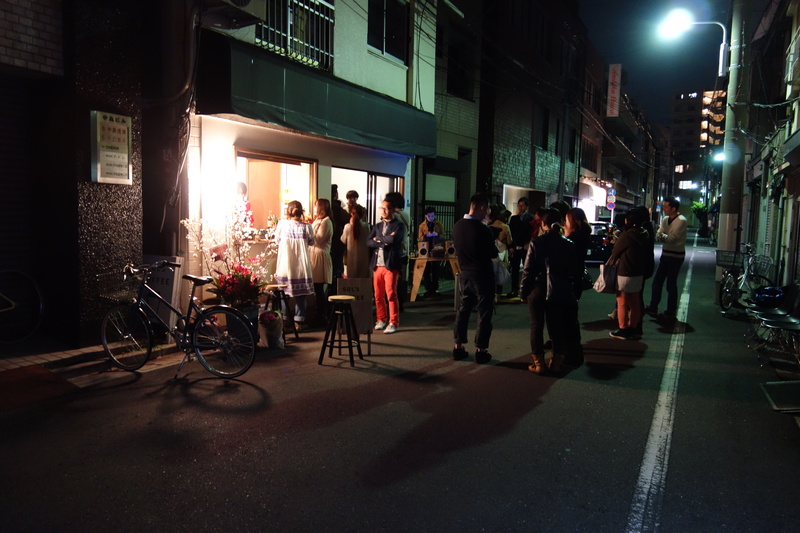 They put up with the street party last night – a rare event for a Tokyo residential block – loud laughter, well-wishers coming and going, a DJ, screaming children. Maybe that’s how much they appreciate the little hole-in-the-wall cafe with no interior and just some stools on the street, created by Rieko Arai. Or maybe they’re just under her spell, calmed by her sunbeams of reassurance. That wouldn’t be hard, given the gentle energy she emanates. Or maybe that’s the beauty of this mixed-zone area, where small factories and apartments rub shoulders. As if at a party. In any case it was only a one-off, last night, marking Sol’s Coffee first anniversary. 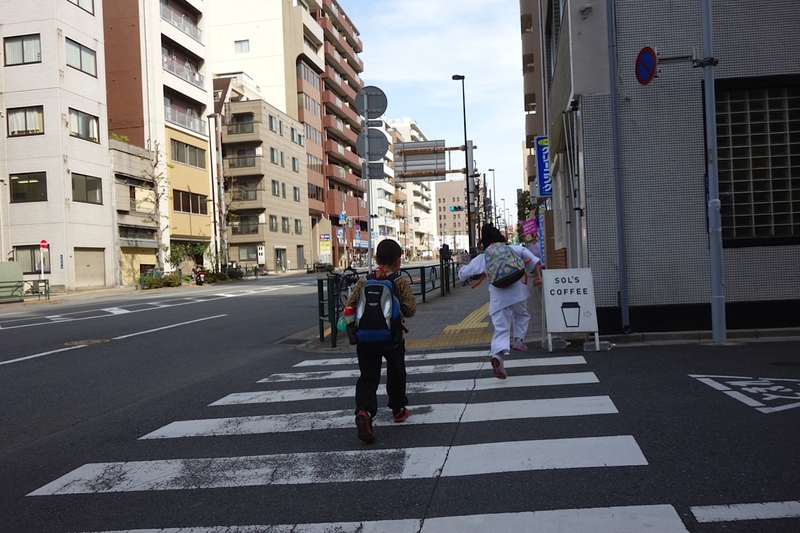 Hey, remember when before you moved into this neighbourhood, how you would come out from Jingumae and just walk around in your free time and weekends, spotting old buildings, following backstreets. And one day you chanced on the sandwich board advertising Sol’s with only the words, Sol’s Coffee, and something about the simplicity of it pulled you down that little lane, and that’s how you found Sol’s Coffee. The guy who served you, the barista, he’s here every time you’ve been since then. Junya, from the island of Kozu in the Izu chain, population about 8,000. 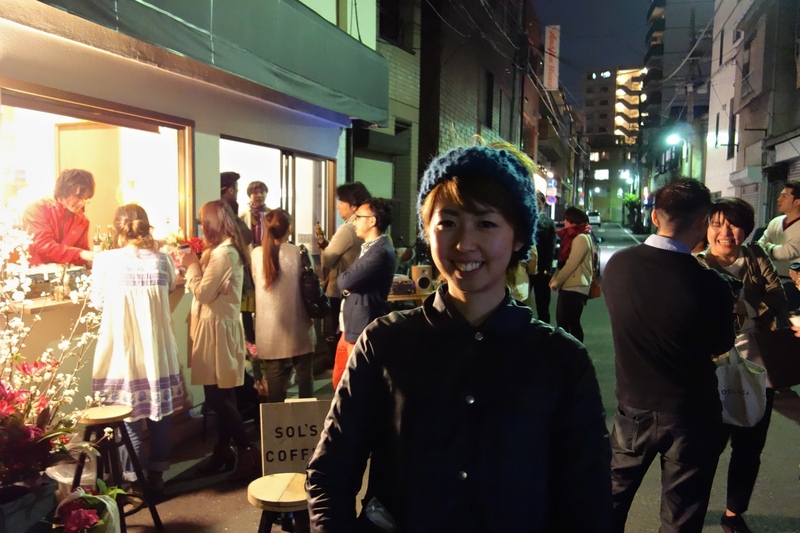 Sol’s Coffee is not Rieko’s first or only cafe. 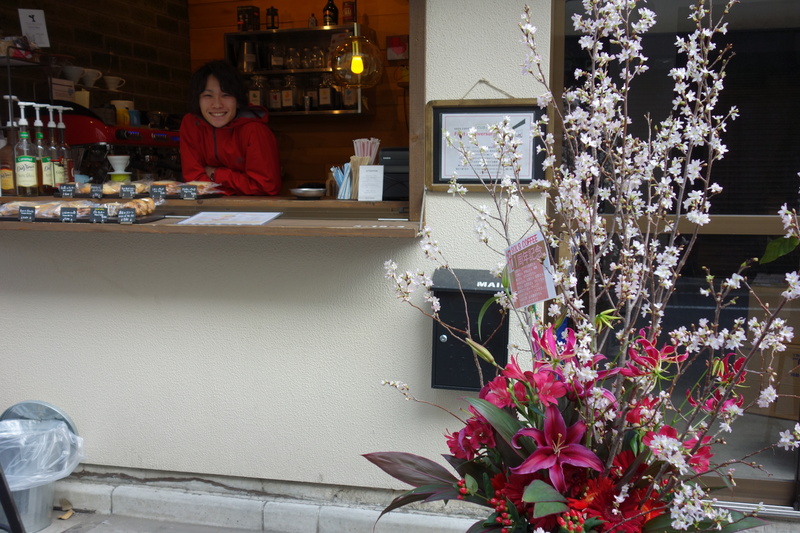 The first would be Sol’s Cafe, in Shin Koiwa, which she opened three-and-a-half years ago. 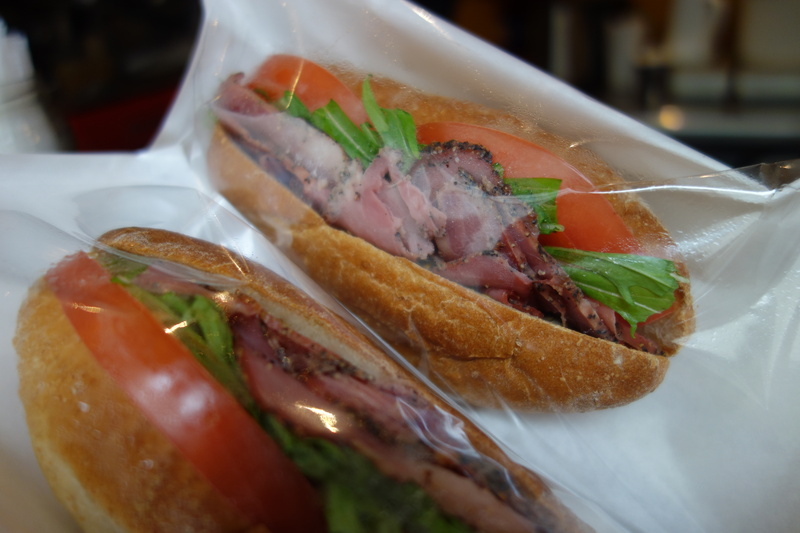 And she runs another small cafe out near Narita. Before opening her business, she did catering and coffee out of a van for two years. And before that she was at design college, where she talked with a fellow student about her dream of doing food and coffee, and they threw around words for a name for it, and she threw out Serendipity, from the movie of that title she likes, and he threw out Life, and they settled on SOL, for Serendipity of Life. And later they got married, which seems kind of apt. So remember how you followed that sudden thirst for coffee, triggered by that simple sign in the sun. Crossed over the main road Kasuga Dori that leads onto the Umaya Bridge, and headed down the lane parallel with Kokusai Dori, and saw just one person in the lane, and how that person turned out to be standing at the window of Sol’s and it turned out to be Shimizu from Monokraft, who you had only met once before and had no idea where his workshop was, and how he then took you around to meet Murakami at M+ for the first time, and other people of the neighbourhood, and how if you think about it, that’s a big part of how you come to be writing this post now. So that day at Sol’s, one thing led to another. Or various things converged. How to put it? In the curious way things seem to happen these days, it was half-expected luck. So at the party, she asks you, Am I being interviewed now, it seems like it, and you suppose that’s what you’re doing, though you hadn’t come with taking notes in mind, or bugging her with questions, as it’s the middle of her party for god’s sake. But will she please stand a little over here, so you can take her photo, and tell you more about Sol’s? You say that’s a pretty good self-made businesswoman you made. She says well if you want to put such a nice spin on it. Hahaha. She says, I started doing my own catering jobs when I was 22, so I’ve never worked for anyone. I never knew anything about companies or even how to write a corporate email. Now in addition to running the cafes she bakes her own bread for the pastrami and other sandwiches they sell, as well as biscotti and cakes under the name – no surprise here – Sol’s Bakery. You say that’s a pretty good self-made businesswoman you made. She says well if you want to put such a nice spin on it. Hahaha. Her cousin studied woodwork art at the ANU in Canberra and Rieko visited several times and stayed. She loves Australian coffee culture. It initiated her into the art of the long black. Sol’s does it with just the right roundness and bitterness, though it’s on the menu as an Americano. 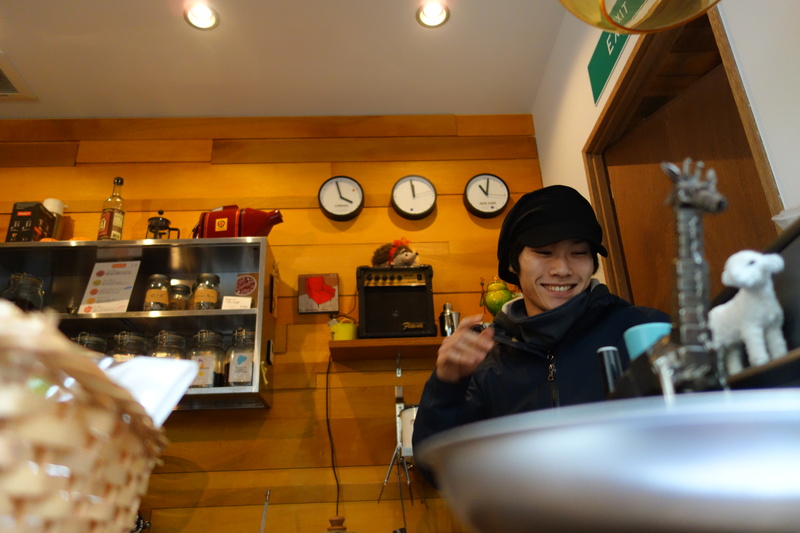 Junya and fellow barista Taichi look after it. Let the coffee make your day. Rieko says, I wanted to say that in life, maybe by chance you can be happy. Thanks for that, I appreciate it.